Last week some of the two-year-olds were having fun pulling apart one of the straw bales we've had in the outdoor classroom since Halloween. This, of course, is the bales' destiny, to be scattered to the winds whether we help them along or not. It was a fun, impromptu project, taking the thing apart first straw-by-straw, then as our work caused things to loosen, up fistful-by-fistful, until we were using two hands to carry away chunks at a time, forming it all into a pile into which we then took turns jumping. This has been my agenda from the moment I saw those bales of straw, to make a jumping pile. I was proud of myself, however, for having waited for it to emerge from the children. I'd not have guessed it would be the two-year-olds who made it happen, but I wanted it to happen if only because we once let some bales hang around the place for the winter. They became saturated with rain, heavy, moldy, mildewy and quite smelly. Mushrooms started growing from them, which was cool, but with the chance that we were propagating poisonous ones made us get rid of the whole thing. Since then, the plan has been to keep them around for a few weeks, then, as the two-year-olds decided, get them gone. In the meantime, our five-year-olds have been experimenting with using our larger loose parts to construct lean-too style shelters which they've called, alternatively, "forts," "houses," and "hideouts." This has been happening off and on since the beginning of the school year. They've been trying out the technique in several locations around the place. Lately, their experiments have involved bracing their constructions against the trunk of one of the cedars that divide the upper and lower sand pits. They've had to work together to wrangle the long planks into place, talking, negotiating, and strategizing. From where I sit, these examples represent high water marks in a play-based preschool: projects that emerge from the children without adult direction or intervention. I'm always amazed by how these things happen; fully engaging community activities that take on a life of their own without a plan, without a hierarchy, but rather by children simply doing what they think needs to be done in order to accomplish something bigger than any one of them could have done on their own. Or maybe more precisely, they could have done it on their own, but would not have. A singular vision can certainly be a motivator, but more often than not, not just in preschool, but in all of life, it's the irresistible lure of a collaborative process that drives the action. We celebrate our solitary heroes, but most great things happen like this: everyone pitching in as they are able and motivated. Their heads are down, their hands are busy, their conversations are short and functional, everything funneling together to result in something that none of them could have envisioned from the start. 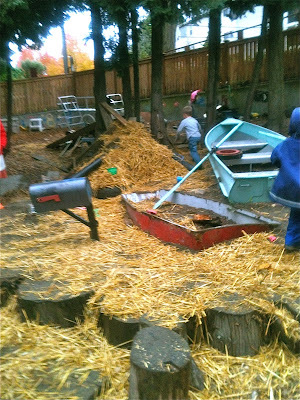 On Friday, after creating their lean-too, the older children found the two-year-olds' pile of straw. I did not see how it started, I don't know who had the idea and I suspect no one does, nor need they: individual credit is a distraction from these projects because they're not about me, but rather about we. All credit goes to us. And in the end it is not mine, but ours.